Rainier: This “Parent Tested, Parent approved” award winning car seat provides the ultimate protection and comfort to passengers. This seat possesses everything that the Radian rXT has and more. The Rainier has extra-deep sidewalls lined with energy absorbing EPS foam to give superior head and body protection and a space-saving design, which allows more room for passengers. This seat also has extended rear-facing capability; it can comfortably seat rear facing children from 5 to 50 lbs. and forward-facing children from 20 to 90 lbs. It can also convert to a booster for children between 50 and 120 lbs. It is clear that thoughtful engineering and wholehearted care went into the design of these car seats. Children can be both secure and comfortable while parents can convert, set up and travel with the seat with ease. It takes an average of just six minutes to set up a Diono car seat from the box to into the car and each seat comes with a 10-year life from date of purchase guarantee. The Radian rXT retails for $359.99 and the Rainier retails for $379.99. 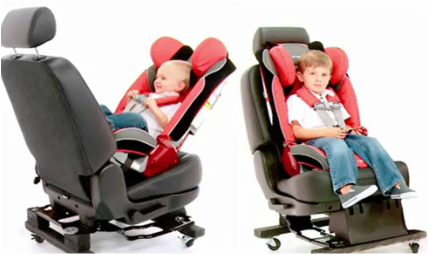 ​Leading car seat safety brand, Diono, has just released two extraordinary new car seats to their state-of-the-art car seat selection. Diono is a brand known for safety, convenience and style. Families all around the country depend on Diono’s innovative, secure car seats to protect their children. These car seats use cutting-edge technology and are designed for the modern “on the go” family. Seats are designed to be portable, convertible and to “grow with the child”. Radian rXT: With a steel alloy frame, aluminum reinforced sidewalls and energy absorbing EPS foam, your child will be both comfortable and secure. This seat includes premium plush interlock knit fabric, 12-position aluminum reinforced adjustable head support, a Safe Stop energy absorbing harness and a unique superLATCH system for a quick installation. The seat is fully lined with energy absorbing EPS foam for head and body protection, can fit three across in most mid-size vehicles, can fold flat for travel and is Federal Aviation Administration certified. It can convert to a booster for children 50 to 120 lbs. or up to 57” in height.